Camshaft Sprocket Bolt 50 ft. lbs. Exhaust Manifold Bolts 35 ft. lbs. Flywheel-to-Crankshaft Bolts 100 ft. lbs. Intake Manifold Bolts (Cast iron) 35 ft. lbs. Intake Manifold Bolts (Aluminum) 35 ft. lbs. Main Bearing Bolts Caps #1-4 100 ft. lbs. Cap #5 120 ft. lbs. Rocker Arm Stud 50 ft. lbs. 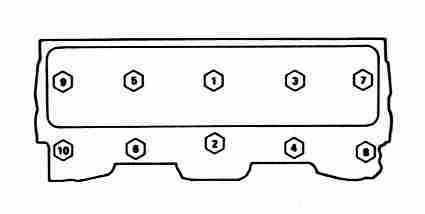 Rod Bearing Bolts (3/8in.) 43 ft. lbs. Rod Bearing Bolts (Super duty) 63 ft. lbs. NOTE 1 After warm up, re-torque all to 100 ft. lbs. except center bolts. applies to all head gasket configurations. NOTE 2 Harmonic balancer bolt must be tightened to exactly 160 ft. lbs..